FOOD REVIEW: How now, Square Cow? Actually, it's going very well! It’s a glorious day, one of the first of what will hopefully be a glorious summer. The sun is shining, shorts are being worn and the beer garden benches have been dusted off. Some might say it’s too nice for a roast dinner, but after a hard slog in the garden (the first nice weather brings grass that needs to be cut and beds that need to be de-weeded) Dish Detective is starving. We decide to try out the newly-opened Square Cow in Wickham. The former Wickham Wine Bar has undergone a transformation and reopened as a pub. The new owners even have the former office next door, with a planning application in to turn that into part of the pub. We have no reservation so we’re in luck to find that most people have opted to sit in its beer garden (which is lovely by the way) and the pub is pretty quiet, apart from a few large reserved tables. As we have the baby in tow, we take a high chair and sit on the table that is the furthest away from any groups so as not to disturb. The place is gorgeous. It dates back to the 16th century and was once the Old Curio Shop. History seeps from the walls (there’s a medieval painted wall covered by a display cabinet, a remnant from the building’s past). There are well-placed trinkets and antiques, and old photos hanging on the walls. Each table has its own unique salt and pepper set – ours look like cow-coloured milk cartons and another table has a couple of pigs. Nice touches like this are all around in the Square Cow, even the ladies' loo is a delight with its flamingoes. Someone obviously has a penchant for design. It’s a Sunday lunchtime so the menu is straight forward – a selection of different roast dinners or a couple of specials. 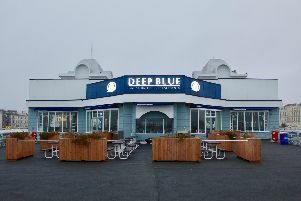 There are three starters (£5.50), all of which include fish – whitebait, prawn cocktail or calamari – so are a no-go for Dish Detective’s partner today. They are also out of the calamari, the only one that caught Dish Detective’s eye. Never mind, more room for dessert. There’s beef, pork, gammon, chicken or nut roast for Sunday roast (£10.95), which are served with Yorkshire pudding, roast potatoes, parsnips, stuffing and veg. A two-meat roast is available (£13.95), as are children's portions (£6.95). On the specials board there’s falafel with couscous (£7.95), prawn and crayfish salad (£9.95) or Stilton and mushroom pasta (£8.95). I opt for the chicken roast. The roast comes out in a generous portion, a big succulent piece of chicken breast – absolutely delicious – is accompanied by an equally delicious Yorkshire pudding and an array of veg. I have cauliflower and broccoli cheese, carrots, tender-stem broccoli, spring greens, a shallot, parsnips and some kind of squash. It’s a fine display of food. The only disappointing factor being the potatoes, which need a bit of love. They were okay, but lacked internal softness, possibly through the omission of parboiling, plus the fat left a slight tang. But there was plenty else to work on. Dish Detective’s partner has not been working quite so hard, plumping for babysitting and reading the paper instead, so is not as famished and opts for the lighter pasta option. It comes served in a bowl, with a side salad and garlic bread, and proves to be the perfect lunch filler. All elements were demolished. Just the one dessert rounds off the lunch – in true Dish Detective style we go for the sticky toffee pudding (£5.50) which comes served with ice-cream. It’s a delicious example of our favourite pud. As we pay at the bar – total bill with drinks comes to £31.40 – we notice they have more than 25 different gins and make a mental note to return one evening and taste them all. The Square Cow with its gin, roasts and garden is a great addition to Wickham’s historic square.